Alcohols are specific class of substances because their molecules can form micro-molecular aggregations called clusters due to hydrogen bonding. Thus physical and chemical properties of alcohols are strongly determined by the sizes and types of formed clusters. In this work various cluster structures of monohydric alcohols were investigated by quantum-chemical methods. 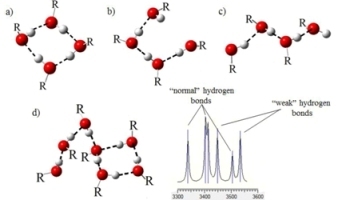 The energy per hydrogen bond was taken as a criterion for the stability of analyzed clusters. Also the IR spectra for all possible types of clusters for each alcohol were calculated. These calculation results were correlated with different experimental data from other researches. On the basis of these data, conclusions regarding the main types of cluster structures which should exist in liquid monohydric alcohols were made. It was shown that the predominant sizes of cluster structures are the same for all investigated alcohols except for the simplest: methanol and ethanol, which have their own features. The equal probability of existence of chain and ring types of clusters for all alcohols including methanol and ethanol was substantiated.